This article, a curatorial response to the 2012 exhibition, was written and considered for the prestigious national magazine Art Monthly. It was not used. When I saw the cover image of Philip Jones’s Images of the interior: seven Central Australian photographers (Wakefield Press 2011), I knew that I needed it for the hybrid art–recreation exhibition I was curating: walking country: 30 years in the arid rangelands, a photographic journey. Thanks for sending me your article on the walking country exhibition. Two aspects I find especially interesting. The first is quite practical – that bushwalkers are usually taking photos “on the run”, and so don’t have time to finesse their shots, or even to carry the heavy equipment needed for technically brilliant photos. I always thought of that as something of a disadvantage, but as you say, it makes it obvious that people are involved in capturing these images of the “wilderness”. And this leads to the next point, that our whole understanding of the landscape is contingent on humans beings involved, and these understandings will vary according to their culture. The hostile response from some bushwalkers (both active and armchair) to Bill Gammage’s The Greatest Estate on Earth has made me realise that there are people with a deep need to imagine the existence of a landscape “unsullied” by any kind of human interference, a landscape that in fact does not exist on this continent. It was obvious to me as a child, walking in the bushland around Sydney and finding some of the amazing Aboriginal rock engravings, that indigenous people had lived there, and in most areas of Australia that I’ve visited their past (and occasionally present) presence can been seen. However, it wasn’t until fairly recently when I read W.J. 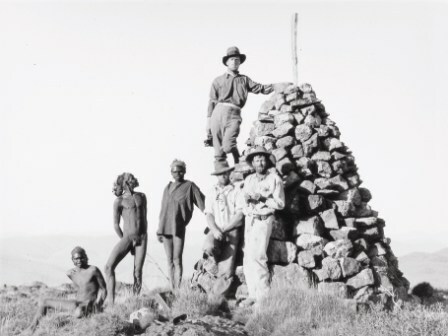 Peasley’s The Last of the Nomads (1983) where he recounts the view of one of the Aboringinal searchers that “the black man had disappeared from the desert” and “the country was finished, it was dead”, that it really hit me that all the areas I bushwalk in have been similarly depeopled, and probably suffering from not being looked after. We’ll be in Central Australia again this year during July, on a trip with CMW that involves car camping and bushwalking. One walk I’m planning is to camp near Bowmans Gap for a few nights and use it as a base for exploring some bits I haven’t been able to visit in the past, as well as just relaxing and enjoying the area. I’d love to see some dingo pups again. Hope you’re well and doing some great walks.